A £2,000 reward is being offered for information about a man following the attempted murder of a Birmingham chip shop manager. The victim, 51, was stabbed several times at Simply Fish and Chips in Hagley Road West, Quinton. He had tried to stop a man after he kicked the door following a dispute in the shop, police said. Crimestoppers has offered the reward for information leading to the arrest of the suspect. 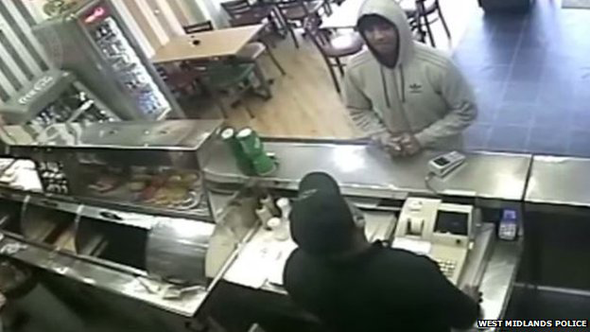 Pauline Hadley, regional manager for Crimestoppers West Midlands, said: "This is an appalling attack which left an innocent chip shop worker with horrific injuries. "We want to ensure whoever is responsible for this appalling crime is brought to justice." The victim was critically ill in hospital after the 6 November attack but is now recovering at home. West Midlands Police is treating the attack as attempted murder. It has already released CCTV of the suspect, who wore a grey hooded top and a black beanie hat.